Every few years a technology comes along that evolves the current approach to become more efficient and cost effective. Software-defined wide-area networking (SD-WAN) connects locations in a revolutionary way, but many “facts” about SD-WAN are more fantasy than reality. 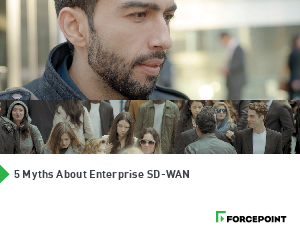 Read “5 Myths About Enterprise SD-WAN” for clarity around the advantages and limitations of SD-WAN and how Forcepoint helps with its implementation. For anyone that has ever had to worry about connecting a distributed network, software-defined wide-area networking (SD-WAN) is a big deal. It’s a drastic upgrade to the status quo, efficiently connecting locations with existing network technology like commodity broadband and virtual private networks (VPNs).